Everyone loves a good mystery, so one way to comply is to host a murder mystery party for your friends. No party is complete without the main game that makes the party fun. 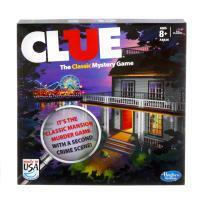 Several different types of murder mystery party games exist, ranging from basic games to dinner games to board games. A murder mystery game centers around one event, a murder that takes place. All the guests at the party are assigned a character. They should portray or represent the character to their best ability as they play the game. Guests uncover clues throughout the game and the evening that lead them to solving the mystery. Set-up of the basic plot from the host after characters are assigned if it is not included in the invitation. Guests might dress in costume, especially if the party is themed, like the 1920s. Guests move about throughout the party area over the course of the evening, mixing and mingling as any party guests would. Clues appear to help move the guests toward solving the mystery. From the moment your guests arrive until the time they leave, have everyone stay in character and act out the script. Most games have a script or a partial outline of what should happen, so hosts and guests can easily follow along. In addition to the basic murder mystery game, you can also look for ones with a particular twist. The main difference between a dinner party murder mystery game and the basic one is that the guests tend to remain at the dinner table, rather than moving around the house or venue where the party is taking place. Typically, dinner murder mystery games have a theme, so you can coordinate the food you serve with the theme of the game. Dinner games tend to be better for small groups of eight to 15 people and tend to last throughout the three-course meal. Some run a little shorter or longer, depending on how long it takes for the guests to solve the mystery. Quick, 30-minute games also exist. Instead of making a whole night out of solving the mystery, guests can play for a half an hour or until the mystery is solved. Detailed adult murder mysteries may not be right for younger kids at a party, but tweens and teens can get excited about solving a murder that is age-appropriate. Look for ones with ages 10 or 12+ or marked "family friendly". Some murder mystery party games are board games. Board games allow guests to sit around a table and use the board, props, cards, and dice to carry out the game and solve the mystery. The board game is less formal than other murder mystery party games. Characters do not dress up and act out scenes as they do in scripted events. The focus is more on that of a typical board game. Downloadable party kits and physical party kits are available in online or in toy stores that come with everything you need to plan the event. Cruising for Murder party kits range from eight party guests to more than 20 guests. In the Cruising for Murder party, guests are onboard the cruise ship, Mystery of the Seas. It is the night of the Captain's Cocktail Reception, which is a week into the cruise. A murder takes place and the guests are involved in trying to figure out who the murderer is that is aboard the ship. The kit includes everything you need to create your party, like an agenda, invitations, character descriptions and objectives, evidence, solutions, and more. In fact, it even comes with certificates and awards if you decide to hand out prizes for contests, which can be personalized and printed. A "clean version" is not available for sale, so reserve this game for adults only. Death by Chocolate is a boxed game for eight to 21 guests. Five of the guests have to be or play male characters and the rest are female characters. While not a traditional three course dinner party, the kit does come with spa and chocolate recipe ebooks, so guests can indulge during game play. 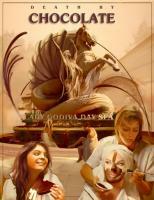 Since the storyline of the game centers around a day spa experience for a bachelorette party, you can offer spa treatments to your party guests to stay true to the script. It is recommended for ages 16 and older. The kit contains both a general booklet and character booklets, along with information for the host, evidence, flyers, awards, and more. Break out the simple board game Clue. Invite friends over for a quick game of mystery and murder. The game comes with the board, cards, characters, and weapon pieces. Guests take turns, playing in character, to figure out who the murderer is, where they committed the crime, and with what weapon. Clue is appropriate for almost all ages, so children can participate. Once Upon a Time...The Fairytale Murders is a dinner party game that you can download and print. The game is intended for 10 players--five male and five female--from the age of 13 or older. The kit includes fairytale-inspired recipes and menu cards that you can print and use during the serving portion of dinner. The game moves along as guest try to figure out who is the killer of two of the fairytale characters. You can also download game booklets, clues, party invitations, wine/bottle labels, full game instructions, and the solution. A Hawaiian Homicide whisks your party guests away to a resort in Hawaii. Six or more players take two to three hours to solve the homicide of a retail hut owner using the host and individual guides, accusation forms, and notes pages that the kit contains. One of the characters is a womanizer and there is a reference to drugs, so it is intended for audiences of a more mature age. 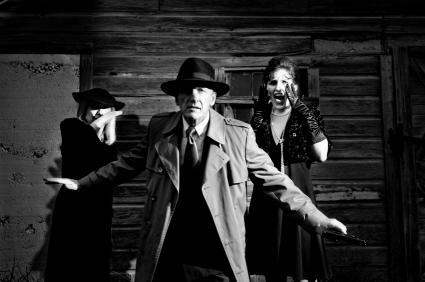 Host a party that uses a 30-minute murder mystery as the entertainment by choosing Don Carrasino and the Murdered Mobster. Best for teens and adults, this game is for eight or more players. The plot revolves around solving the murder of the Don's right-hand man Chuckles, who dropped over in the Don's own bar. The downloadable kit includes an introduction, guidebook, character sheets, and more. It is meant to be played around a table in several rounds as the guests take on their character roles and answer questions from other players. Hosting a theme party can be fun, and a murder mystery is a unique party theme. Depending on the size and age of the guests, you can keep it simple, such as a board game, or go lavish, such as hosting a scripted game complete with dressed up characters and weapon props.